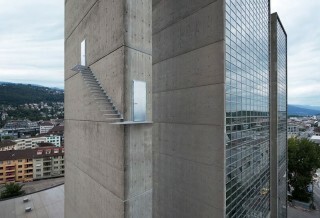 I just came across this amazing staircase by swiss artists Sabina Lang and Daniel Baumann. The construction itself is enough to make my tummy spin. At first look, I thought this was a functioning staircase, and was amazed it could have gotten past all the safety regulations (I know all about the domestic side of this from looking to install a staircase in my flat in London). However, the fact that Lang and Baumann are called artists, rather than architects or designers, gives the game away. This is art, not design, and thus does not to conform. But it’s not just this. After the read more you’ll see what happens when the sun shines through the staircase.